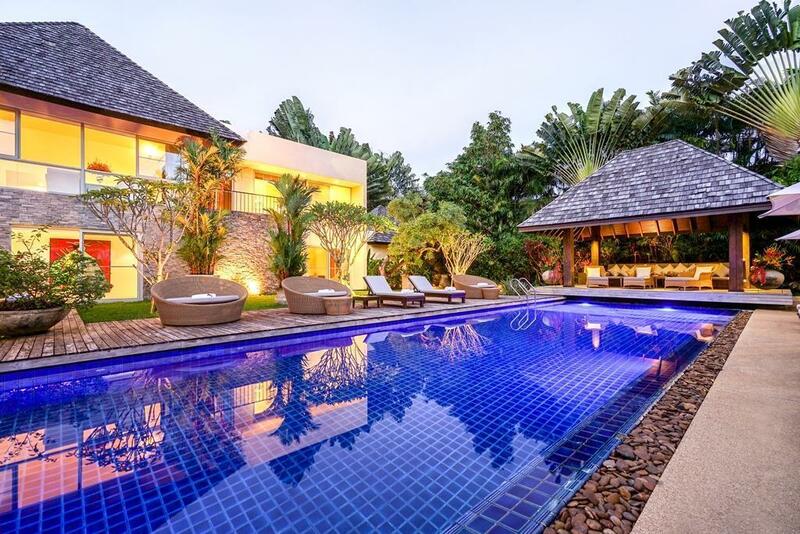 Villa 453 is a five-bedroom tranquil haven offering space, elegance and total privacy, just minutes away from the soft-sand beaches of Layan and Bangtao on Phuket's west coast. 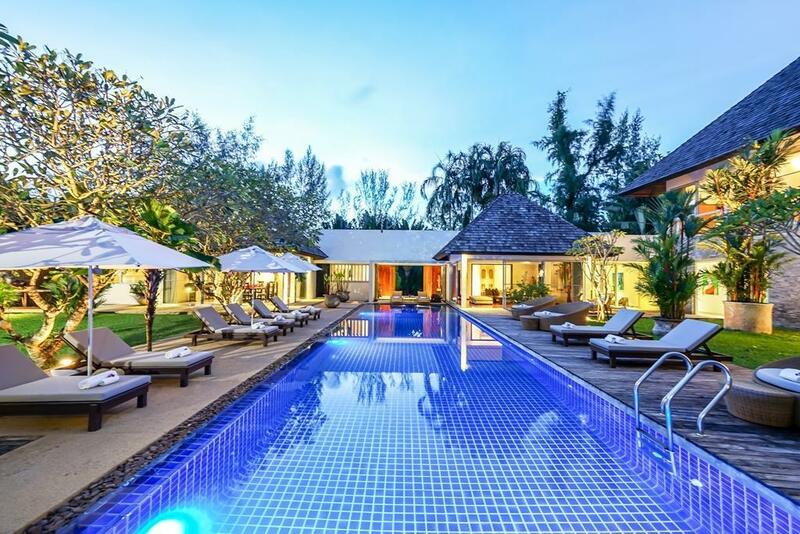 Ideal for extended families or groups, this spacious holiday retreat features a stunning 20-metre swimming pool and a full complement of quality services. 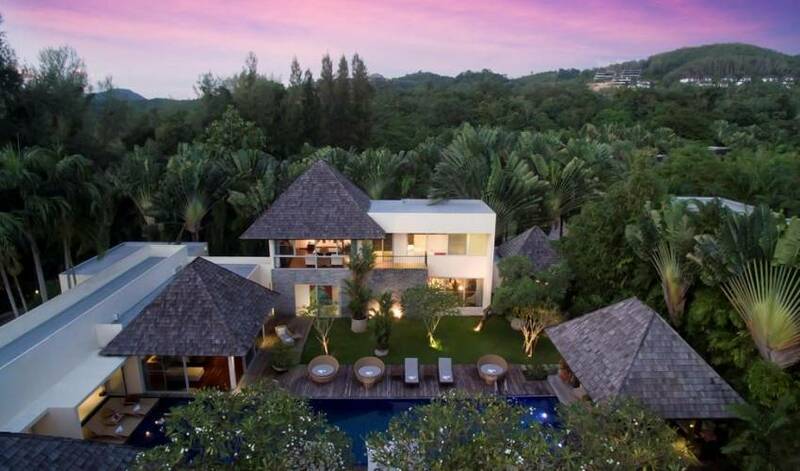 The villa's lush tropical landscape, seamlessly connected indoor-outdoor spaces and expansive Thai contemporary design offer a wonderful balance of private and fun spaces for families to enjoy, as well as providing a fantastic venue for weddings and special events. 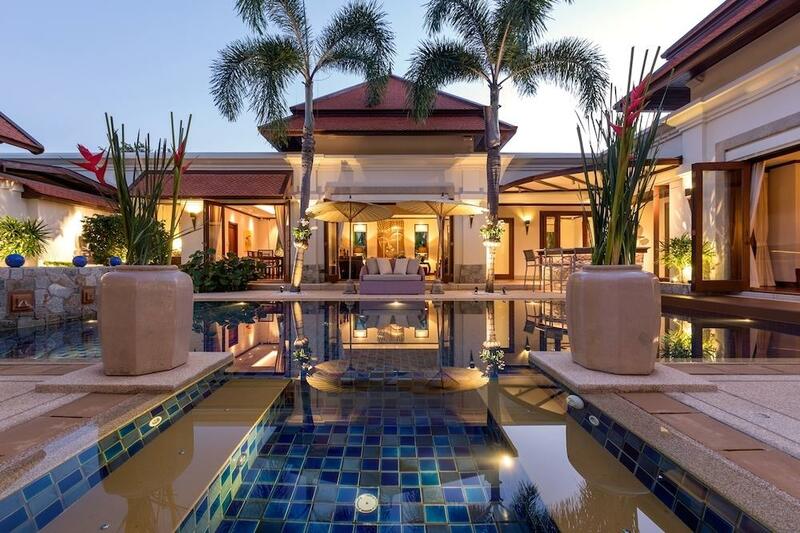 A sense of majesty ensues from the moment you arrive at the villa. 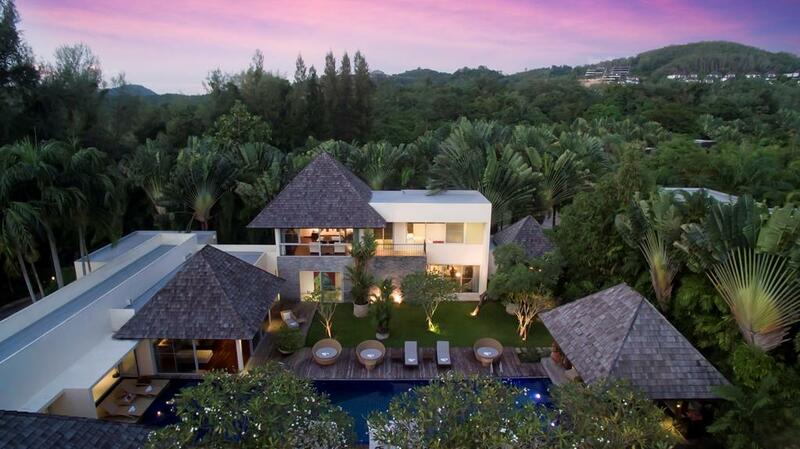 Entering through its oversized teak front doors is to step inside another world; a true tropical escape. A long stretch of glimmering blue meets you on arrival: the 20 by 5-metre infinity pool, where life in the villa revolves. 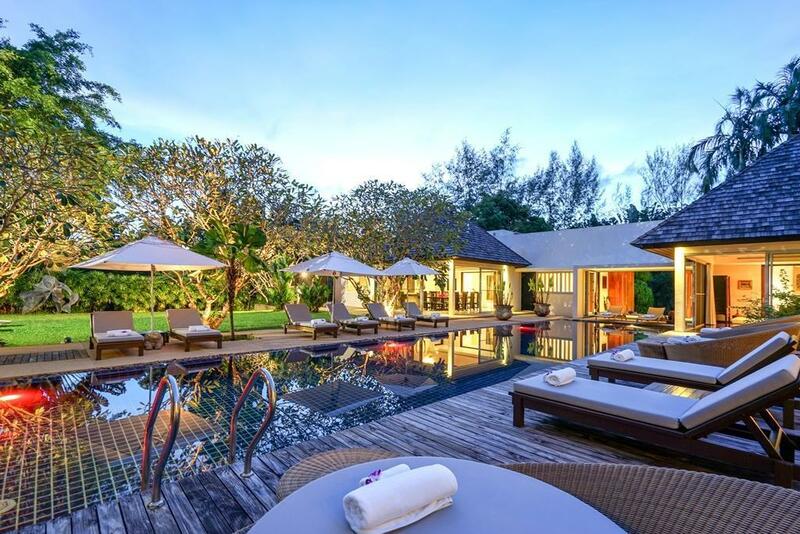 The spacious wooden pool deck offers a divine choice of spots to catch the sun's rays, while a lovely outdoor sala provides a shaded lounge area just a hop away from the 10-person jacuzzi. 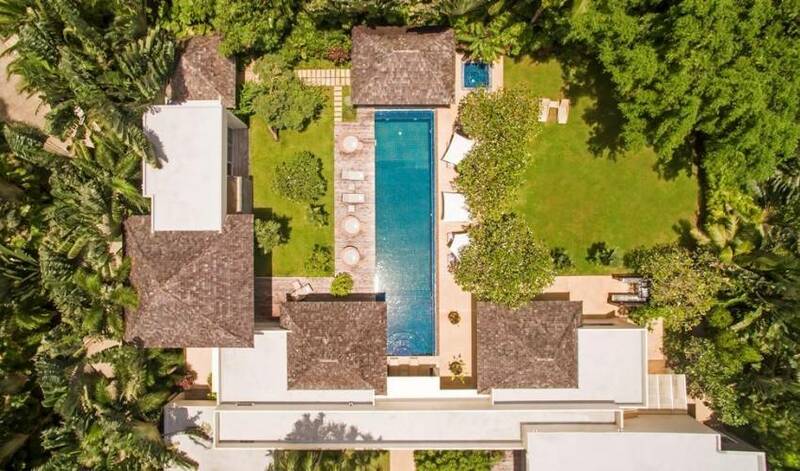 Towering fan palms and a rich variety of tropical garden plants create a vivid green landscape and a natural border that keeps the villa ultra private and secure. 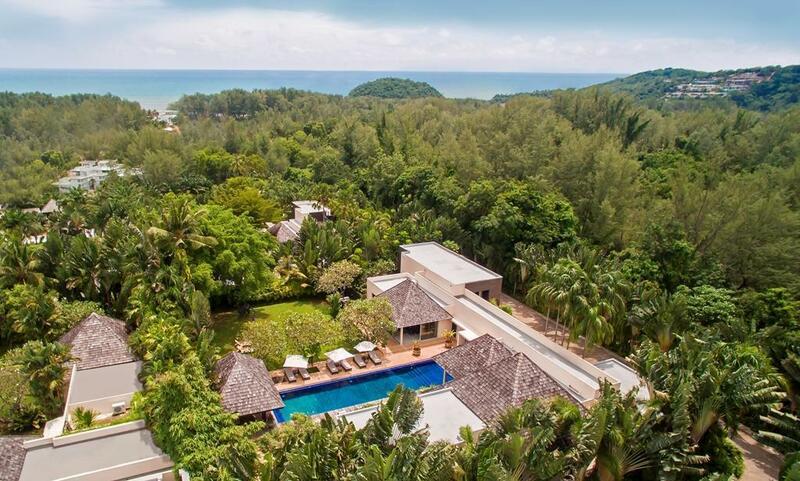 Inside, adding character and colour throughout the villa, is a remarkable collection of art and antiques from traditional Thai temple spires to ancient Buddha statues to bright whimsical paintings, including several depicting Asian archetypes by Belgian artist Christian Develter. 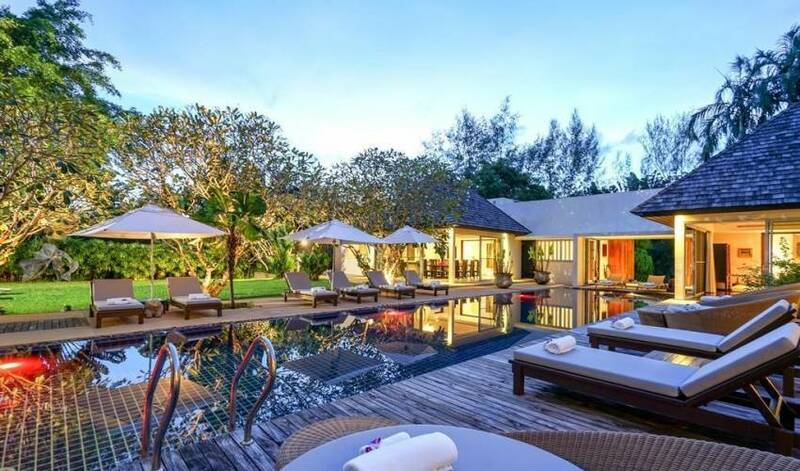 The villa manager, chef, maid and concierge service ensure that every need is taken care of efficiently and with utmost professionalism and care. 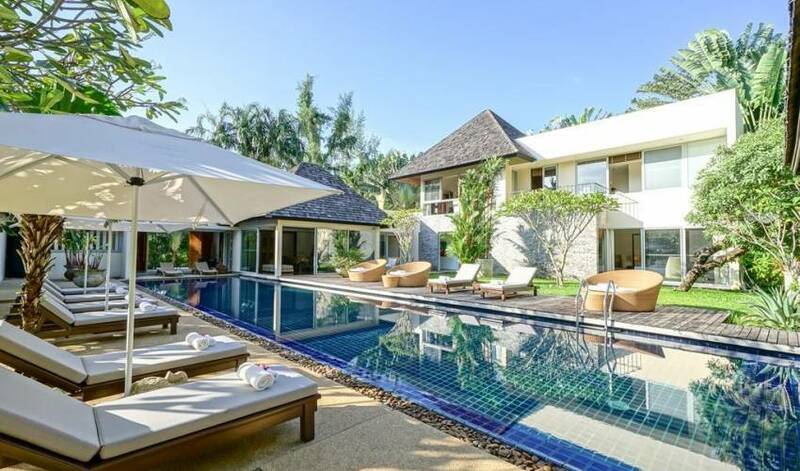 Enjoy a full range of services on offer, from poolside massages to babysitting to booking a round of golf. Master Bedroom 1: Pool view balcony, fan, aircon, luxury king bed (180w x 200w) with duvet and pillows, chaise lounge chair, walk-in closet, 42" flat screen TV/DVD, landline telephone, en-suite bathroom with spacious soaker tub, dual vanities, separate shower and toilet, and safety deposit box. Bedroom 2: Pool view, deck, fan, aircon, luxury king bed (180w x 200w) with duvet and pillows, two wingback chairs, desk and chair, walk-in closet, TV/DVD player, landline telephone, en suite bathroom with dual vanities, separate shower and safety deposit box. Bedroom 3: Garden view, deck, fan, aircon, luxury twin beds (110w x 200w), daybed, his/hers closet, TV/DVD player, landline telephone, en-suite bathroom with dual vanities, separate shower and toilet, and safety deposit box. Bedroom 4: Garden view, private deck, fan, aircon, luxury twin beds (180w x 200w) that can be converted to one king sized bed, generous closet space, desk and chair, TV/DVD player, landline telephone, en-suite bathroom shared with Bedroom 5 with dual vanities, separate shower and toilet, and safety deposit box. Bedroom 5: Garden view, fan, aircon, luxury twin beds (110w x 200w) with duvets and pillows, daybed, generous closet space, TV/DVD player, landline telephone, en-suite bathroom shared with Bedroom 4 with dual vanities, separate shower and toilet, and safety deposit box. Kitchen: Complete western kitchen with pool view, bar/breakfast nook with seating for two, kitchen table with seating for four, landline telephone, microwave, aircon, two-door fridge/freezer, double sink, and toaster. Living Room: The villa features a large living room area with a wrap-around sofa providing the ultimate in comfort to unwind and relax. 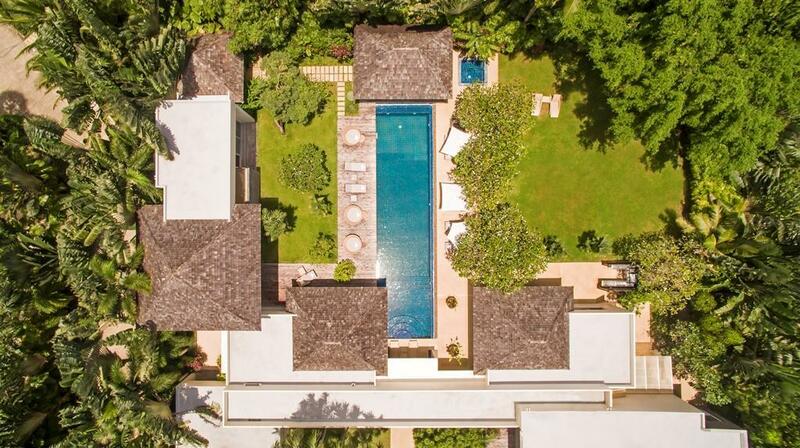 This beautiful space opens to reveal lush gardens, an inviting 20 metre swimming pool and is the perfect space to spend time reading or enjoying the luxurious surroundings in the shade. Home Theatre: 42-inch flat screen TV with DVD player and DVD library, 100 satellite TV channels, CD player and CD library, landline phone, BOSE surround-sound stereo, and comfortable seating for six+. Office/Library: desk and chair, fax/copier/scanner, landline phone, library of books, sectional couch, and expansive private garden patio with seating for six. 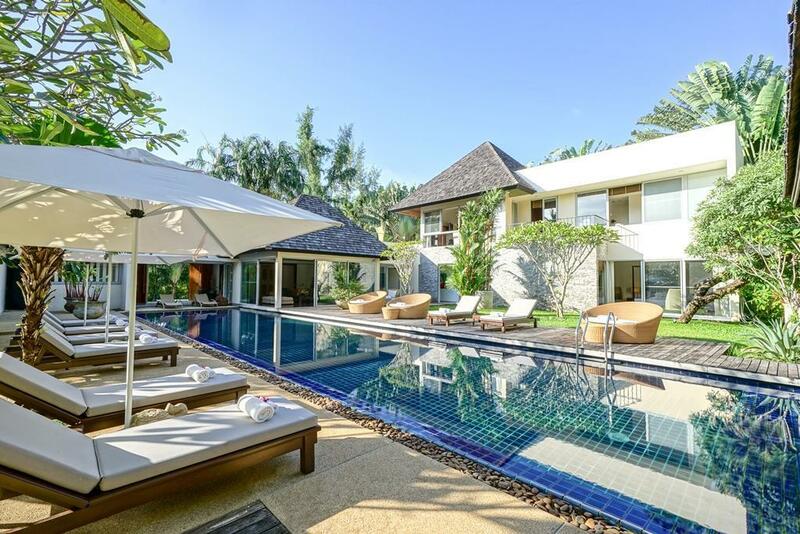 Outdoor Sala: Pool view, with coffee table and four wicker armchairs, settee with seating for eight+ additional people. 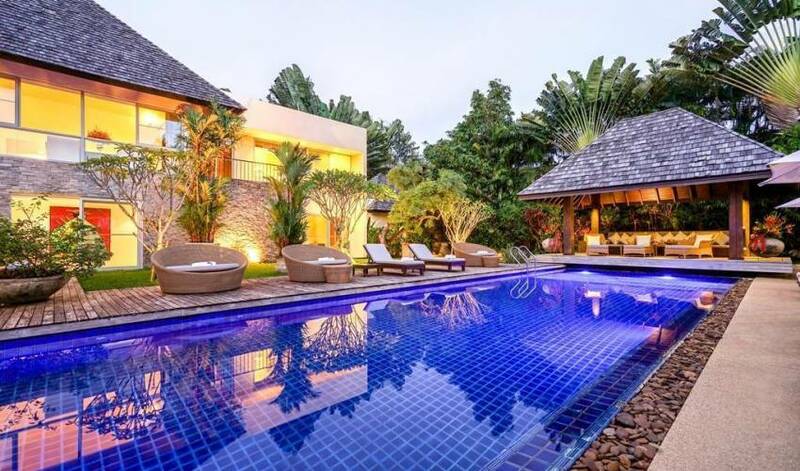 The villa is located in the secured Layan Estate with high walls and dense foliage giving it complete privacy from neighbouring villas within the estate. Set away from the busy tourist areas, the villa has a feel of total seclusion yet it is easy to access Phuket’s superb west coast beaches and many of the island’s finest dining, shopping and leisure attractions including a two minute drive to Nikki Beach Club. 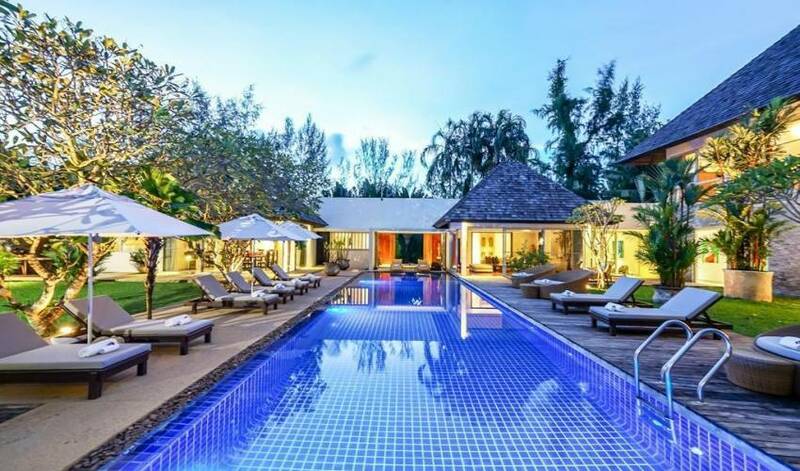 Just two kilometres away is the world-renowned Banyan Tree Spa, the Laguna Phuket Golf Club, and a wonderful range of dining and shopping choices in and around the Laguna resort complex on Bang Tao Beach. The peaceful powder-sand Layan Beach, one kilometre west, retains an idyllic, sleepy feel with traditional longtail fishing boats gliding in and out of the estuary behind it. Shopping centres, nightlife entertainment, international hospitals, more golf courses, marinas and other leisure facilities all are found within a 15- to 20-minute drive. 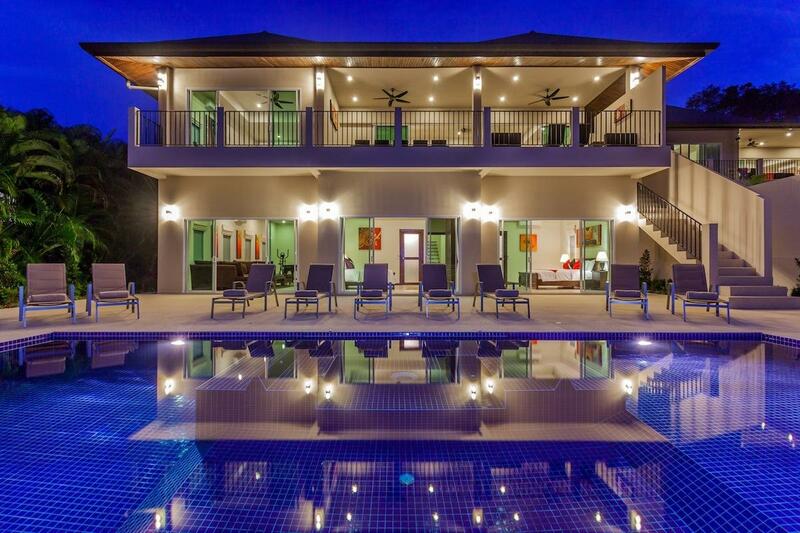 The villa is a 25-minute drive south of Phuket International Airport. Check In and Check Out: Check in time is 3.00 pm. Check out prior to midday. We will try and accommodate you where possible, subject to bookings.